Presentia is the only presentation software that has been specifically developed to directly meet your sales presentation needs. A key element of any new business pitch is the quality of your presentation. Communicating your message in a more interactive and meaningful way could make all the difference in a sales situation, ultimately winning you more business. Presentia offers an innovative solution for sales and marketing communications, designed to help you create engaging presentations that excite your audience. Our presentation software has been developed with business presentations in mind. It boasts a wide range of features that will help your business create and share better quality presentations. With an easy to use interface, Presentia enables sales and marketing teams to quickly and easily create interactive, engaging presentations that are always up to date and on brand. Administrators can create complete presentations and/or templates with asset folders to distribute to other sales users. Content such as fonts, colours and approved imagery can also be locked down, protecting corporate branding. 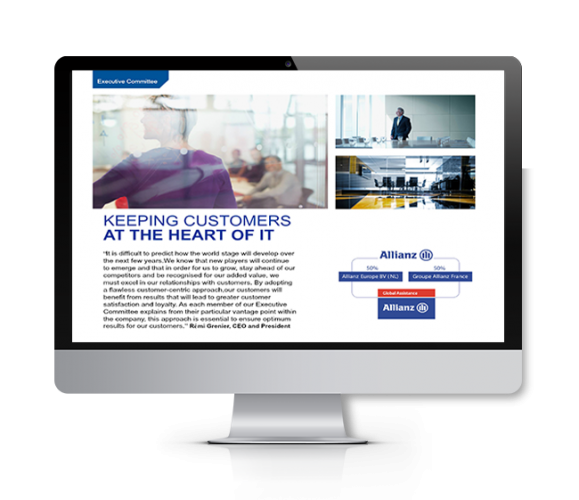 With the ability to work both on and offline, administrators and sales users always have all presentation content on hand to present whenever and wherever, on laptop, desktop, iPad or tablet. Presentia doesn’t require technical or design skills to create more appealing slides, and offers a complete solution to all presentation issues that are common within sales and marketing teams. We’ve been helping clients across all industries improve their sales presentations for over 20 years. View some presentation examples or contact us to discuss your requirements.